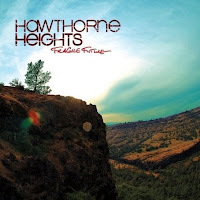 Hawthorne Heights had to overcome tremendous amounts of adversity to release this album. It's hard not to tip your hat to them. After spending months in legal battles with their record label, Victory Records, the band was devastated by the death of guitarist Casey Calvert. While there is some controversy surrounding his death, the band insists that the death resulted from a combination of legally prescribed medications, including Vicodin given for a recent root canal. In spite of all this they were able to resolve their differences with Victory Records and move past Calvert's death with the decision of not replacing him - a symbolic gesture that he will always be with the group in spirit. Despite my admiration when hearing the opening track "The Business of Paper Stars" I was very disappointed. I prepared myself for the very boring, overdone sound of punk guitars with a whiny voice. This track was followed up by their first single "Rescue Me" and I was hooked. The first verse with catchy guitar stops as JT Woodruff's firmly sings "You're hollow, You're shallow, All the Cowards sat in silence" won me over. This beauty was followed up by "Until Judgement Day" a great song with a superb pre-chorus "I just fell in love for the first time." I may have fell in love with Hawthorne Heights for the first time. Well...let's not get too carried away. The album has its boring moments. I could easily skip over "Sugar in the Engine" and "Desperation." And while the album has a pinch of ingenuity its overtones are that of your typical punk/alternative band that has been done, redone and done again. And I'm the only one that thinks that "Disaster" sounds like a complete rip-off of Jimmy Eat World's "Get It Faster"??? I do recommend this album. I'd give NIN an A+ because its free. Loved Year Zero.